The EPA has officially opened its public comment period on proposed new rules for the National Contingency Plan. The ALERT Project has compiled a list of what we consider to be the ten most critical points. This list has been peer reviewed by scientists and lawyers, all of whom have been involved in oil studies and issues following large disasters. We have also prepared sample language for your convenience, to help you submit your own comments to the EPA. Click the titles below to learn more about ALERT’s recommendations about the National Contingency Plan. 1. Have the right people in charge of decision-making. EPA: During the BP Deepwater Horizon (DWH) disaster, the US Coast Guard (USCG) asserted authority over EPA regarding the use of dispersants. While heroic first-line responders, the USCG is unfortunately not qualified nor authorized to preside over decisions for product use during oil spill response. By Executive Order, the President delegated this ultimate authority under the Clean Water Act to EPA to establish a Schedule listing what products may be used, waters in which products may be used, and quantities of products that can be used safely in such waters. EPA should clarify its existing authority to make the final call on any product use. Withdrawal of concurrence: EPA should authorize that withdrawal of concurrence by any agency, Tribe, or state RRT is the equivalent of a NO or blocking vote, meaning that offending response activities should be modified or halted until concurrence of all key entities is resumed. Otherwise important decisions that require agreement (concurrence) of other agencies and entities will default to the sole discretion of the On Scene Coordinator. Area Committees, LEPCs, Citizens’ Advisory Councils, and federally-recognized Tribes: Under the Oil Pollution Act of 1990 (OPA90), Area Committees consisting of local governments were created and tasked with developing Area Contingency (C-) Plans, including preauthorization plans, in coordination with Citizen’s Advisory Councils and Local Emergency Planning Committees (LEPCs), authorized under OPA90 and the Emergency Planning and Community Right-to-Know Act (SARA Title III), respectively. It is extremely important that Area C-Plans are created by people, including Tribes, who are most familiar with the locality in question. EPA should not extend the responsibility of developing Area C-Plans to include state agencies with the Regional Response Team (RRT). However, EPA should require review of Area C-Plans by EPA and the USCG as co-chairs of the NCP, NOAA for endangered species, OSHA and DHHS for human health, and the state RRT. Further, EPA should require public review at least every 3 years, or more often if plans don’t work as intended, to keep plans current. 2. Expand the scope of Area Contingency Plans, including preauthorization plans. Area C-Plans, including preauthorization plans, are the core of contingency planning and spill response. It is important that our NCP include provisions to protect human health and welfare, as well as the environment, and to prepare for spills of Unconventional Oil and Gas. EPA should expand the scope of Area C-Plans to include, at a minimum, provisions to: track and monitor oil, product, and oil-product combinations in water and air; conduct ecological and human risk assessments and monitoring; provide alternative water supplies; determine when area closures and evacuation are necessary; identify safe storage and staging locations for products and personal protective equipment for workers; provide 40-hour HAZWOPER (Hazardous Waste Operator) training and health screening tests for workers (no exceptions); monitor worker and public health with OEM (Occupational and Environmental Medicine)-trained observers; and dispose of recovered oil and oily debris as hazardous waste, not in public landfills. 3. Create more Area Committees with companion Citizens’ Advisory Councils. Safe transportation of crude oil is a nation problem, yet many areas of the country do not have Area C-Plans and preauthorization plans because they do not have Area Committees or Citizens’ Advisory Councils. The Oil Pollution Act of 1990 created Area Committees to bring local knowledge into the contingency planning process to help ensure that plans would work in practice. Further, OPA90 created Citizens’ Advisory Councils to reduce industry-government complacency as effective citizen engagement and oversight of energy operations was found to be critical to the proper functioning of industry, government, and civil society. Area Committees and Citizens’ Advisory Councils are the right and left hands of creating functioning, effective Area C-Plans. EPA should, and it is critical to, create more Area Committees – and companion Citizens’ Advisory Councils – to develop Area C-Plans in communities at risk from oil activities. 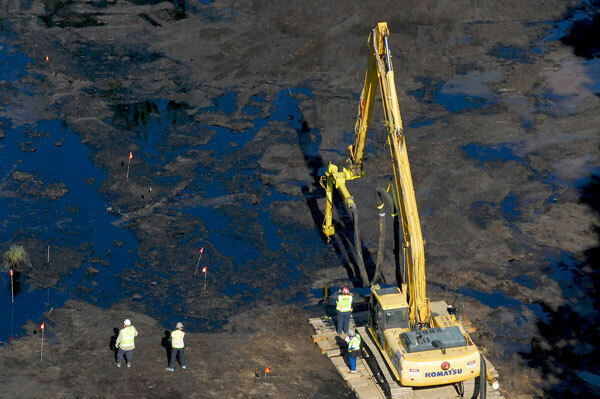 EPA should secure funding for these activities from the Oil Spill Liability Trust Fund. In the advent of a spill in communities without an Area C-Plan or preauthorization plan, EPA should require the On Scene Coordinator to act in accordance to areas with such plans by using only products listed on the Schedule, with concurrence of (not consultation with) key agencies, and acting to protect or minimize harm to human health and welfare, and environment (see Points #1 and 2). 4. Use only non-toxic products that will do no more harm during spill response. Carry warnings on SDS (Safety Data Sheets) in the case of accidental spills to keep substance out of surface waters or sewers. any product on spills of Unconventional Oil and Gas that has not been specifically tested for such UOG crudes and met the toxicity and efficacy listing criteria, as such tests are the core of contingency planning. Using untested products is a violation of the Clean Water Act. 5. Close the loopholes that negate the planning process. Burning agents: EPA proposes to allow the On Scene Coordinator (federal or state agent in charge of oil spill response) to authorize use of in-situ burning if such burning is preauthorized. There are too many variables to consider such as wind direction and proximity to urban populations. Instead EPA should revise the existing rule to allow the OSC to authorize burning only on a case-by-case basis with concurrence of agencies, including OSHA and DHHS. In addition, EPA should not support use of refined oil products such as gasoline or jet fuel as burning agents. EPA should not create a spill to clean up a spill. Anything, anywhere, anytime: EPA proposes to maintain its long-standing rule authorizing the OSC to use any product, including those not on the Product Schedule, anywhere and anytime the OSC determines such use is necessary to protect human life. There is too much potential for doing more harm, as the US Coast Guard, in particular, has displayed remarkably poor judgment in past spills about what is necessary to protect human life (such as NOT requiring respirators on in situ burn responders during the BP DWH, for example, or allowing in-situ burning during the Exxon Valdez disaster without considering impacts on downwind communities). EPA should tighten this loophole by limiting use to 48 hours maximum, as proposed, but only for products listed on the Product Schedule and only with concurrence of key agencies including NOAA for wildlife, OSHA and DHHS for human health, and the state RRT for local concerns. 6. Establish general listing and testing and monitoring requirements for all agents and certain sorbents as a basic right-to-know if product is non-toxic and effective. General listing requirements: EPA should, as proposed, require more general product information from accredited sources to allow for better decision-making regarding product use. Agents except Burning Agents: EPA should, as proposed, require updated acute and subchronic toxicity testing for dispersants using accepted standard methods with testing from accredited laboratories. EPA should not replace the accepted standard Swirling Flask Test, developed by EPA Canada, with the non-standard, not accepted Baffled Flask Test, designed by industry. However, EPA should require that all agents, not only dispersants, are similarly tested with updated acute and subchronic toxicity tests, and efficacy tests, using accepted standard methods with testing from accredited laboratories. Further, EPA should require maximum toxicity test standards and minimum effectiveness standards for all agents. Also, EPA should require environmental fate and persistence information for breakdown products and oil-product combinations, and data and information on whether the product is anticipated to enhance oil interactions with suspended particulate matter and increase sedimentation; i.e., to act as a sinking agent. Sorbents: If any sorbents are to be used in bulk form, which EPA should not allow (see Point #4), then EPA should require similar testing as for agents, noted above. Further, EPA should require general listing information for manufactured synthetic sorbents. Burning agents and ignition devices: EPA should require general listing requirements for ignition devices and burning agents with full disclosure of product ingredients as for the other agents and substances. In case of accidental exposure, people have a right-to-know the product ingredients. In addition, EPA should require efficacy tests using accepted standard methods with testing from accredited laboratories for water or air temperatures less than 50ºF. 7. Require site-specific monitoring and testing to determine if the product might work as intended and if the product did work as intended during and after use. Before use on a spill: EPA should, as proposed, authorize the state Regional Response Team to request of the manufacturer or the EPA additional testing and monitoring of any product to address site-specific concerns during planning and development of preauthorization plans. However since EPA should not allow RRTs to develop Area C-Plans and preauthorization plans (see Point #1), EPA should extend this authority to Area Committees and Citizens’ Advisory Councils. During and after spill response: EPA proposes to establish monitoring requirements for environmental impacts and efficacy only for dispersant use and only in response to catastrophic spills the size of the BP DWH); to monitor any subsurface dispersant use, which EPA should not allow (see Point #4); and for extended dispersant use over 96 hours. Instead EPA should require environmental and human health monitoring for all agents, including burning agents, and sorbents in bulk form (if allowed), any time agents and sorbents are used for any size of spill, for any length of time. It makes sense to monitor impacts and efficacy of product use during smaller spills to determine if products are working as intended before use on a large spill. Further, EPA should require monitoring be conducted for at least 10 years to gain understanding of long-term impacts to ecosystems and humans. Also EPA should adopt the Prince William Sound Regional Citizens’ Advisory Council’s monitoring protocols for dispersants. Most importantly, EPA should not put the spiller in charge of environmental monitoring, due to an obvious conflict of interest! Instead, EPA should require monitoring be conducted by NOAA for wildlife and ecosystem impacts, and OSHA and DHHS for human health impacts, under supervision of the EPA, US Coast Guard, state RRTs, federally-authorized Tribes, and the Trustees for Natural Resources. EPA should secure funding for such monitoring studies from fines and penalties or, in the case of an insolvent spiller, from the Oil Spill Liability Trust Fund. 8. Reduce risk to the environment and people by ensuring readiness of quality products, recovering agents from the environment, and reporting product use. Ensure product readiness: EPA should, and proposes to, require documentation of storage conditions and retesting of product effectiveness every 5 years to ensure quality products are ready for use. Recovery of products: EPA proposes to require that certain agents are 'adequately' removed and disposed of. EPA should also require removal and disposal of substances and oil-product combinations. Further, EPA should establish criteria and monitoring for removal actions. Reporting product use: EPA should require reporting of product use, including agents, burning agents, and substances, to state RRTs and local Area Committees on a daily basis as people have a right-to-know what products are being used in their locality when it is used, not 30 days after the fact. 9. Establish a public process for appeals and removal of products that don’t work as intended, and for transitioning to the new rules. Removal of products from the Schedule: EPA should add specific criteria for product removal such as product discontinuation, monitoring studies that find unanticipated consequences to the environment and/or human health, or changes in community acceptance especially in areas where product is being or was used. Further, EPA should establish provisions for stopping product use during spill response when an appeals process is initiated. Transitioning to the new rules: EPA proposes that all products currently listed on the Schedule must be retested under the new rules within a 2-year transition period. In addition, EPA should require testing for any agents, substances or mitigating devices not currently on the Schedule but addresses above such as burning agents and manufactured synthetic sorbents. Further, EPA should shorten the transition period to 1-year and establish prioritize use of products on the new Schedule rather than the current Schedule. 10. Clarify definitions to ensure that we understand what we are dealing with and can plan to minimize harm from oil and products. Agents and substances in general: EPA’s proposed definitions are overly bold in that each claims that the agent or substance will perform as intended, which is often not the case. EPA should clarify that the agent or substance: is not likely to cause additional harm, either alone or in combination with oil, to public health or welfare or the environment; 'may' perform as intended; and either is or is not intended to be collected and recovered from the environment. Dispersants: EPA should clarify that dispersants increase sedimentation and deposition of oil in the environment, and increase harm to the environment rather than mitigate it. In other words, dispersants act as sinking agents. Products: EPA should revise this definition to include burning agents, ignition devices, and substances that are manufactured using a unique composition or formulation. Sinking agents: The proposed definition is a nightmare: It is cleverly worded to specifically include (not exclude) agents and substances, such as dispersants and sorbents in bulk form, that are known to act in combination with oil to create oily plumes and increase sedimentation and deposition of oil. EPA should clarify this definition to include any product (agent, substance, or device) that acts to move oil beneath the water surface, retains oil beneath the water surface, and/or increases aggregation of oil-sediment particles beneath the water surface, irrespective of specific gravity. Oil as additional revision: Ecosystem monitoring in the wake of the Exxon Valdez oil spill found that oil is more toxic than thought during the 1970s and that even short-term exposure can result in long-term harm to wildlife and people. UOG is known to be even more hazardous by nature than conventional oil as tar sands crude is concentrated in Polycyclic Aromatic Hydrocarbons while Bakken shale and other crude produced by new techniques of hydrologic fracturing is concentrated in the volatile aromatic hydrocarbons. Since oil is now known to cause long-term harm like hazardous substances, EPA should update the definition of oil based on the current state of scientific knowledge: i.e., that exposure to oil may reasonably be anticipated to cause death, disease or infection, behavioral abnormalities, cancer, genetic mutation, endocrine disruption, reproductive malfunction and other physiological malfunction in exposed organisms and their offspring, including humans. Remove or removal as additional revisions: Since oil is a hazardous substance, EPA should also revise and update these definitions to include some of the considerations reserved for hazardous substances such as action to: provide for temporary evacuation, housing, and alternative water supplies; treat and dispose of recovered oil and oily debris as hazardous waste; and provide emergency assistance under the Disaster Relief Act of 1974. Make your public comment on the EPA revisions by clicking on this link to the Federal Register.